Year after year, I read about the “rapid rate of network commoditization.” Yes, it is indisputable. Even as network service providers have been investing billions to build out networks, the margins on connectivity services are shrinking and enterprises have more and more providers competing to get their business. To add insult to injury, market power has shifted to application and content providers—Google, Apple, Facebook, Salesforce.com and others—who are building high-margin businesses on the backs of the service provider networks. Plenty of network service providers are fighting back and launching managed services in an attempt to elevate their brand’s value, generate new revenue streams and hold onto their customers and profits. It’s not an easy transition; the new services must be deployed without degrading existing connectivity services and without costly network upgrades. Additionally, SMBs and SOHOs represent the largest market opportunities for managed services. Providers must slash operating expenses and simplify enterprise-class platforms to win a share of this large and more cost-sensitive managed services market segment. Fortunately, there are exciting alternatives being developed that build on Software Defined Networking (SDN) and Network Function Virtualization (NFV) advancements to enable affordable and profitable managed services for businesses of all sizes. SDN gives service providers an evolutionary path for radically evolving network architectures by separating the control and data planes used to process and forward network traffic. This separation allows the provider to scale both planes in a very efficient manner. Additionally, instead of reconfiguring dozens of legacy network devices, many with proprietary interfaces, SDN centralizes intelligence in the service provider’s core, leaving individual routers or switches to handle simple forwarding. 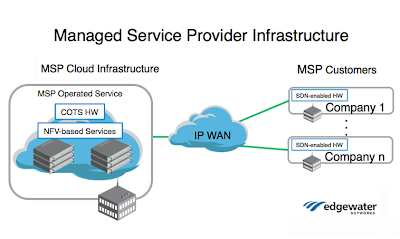 This dramatically simplifies configuration and network wide policy enforcement. NFV enables the virtualization of many generic network functions such as IP routing, firewall, IDS/IPS, server load balancing, caching and VoIP B2BUA. Virtualization brings to these network functions all of the usual benefits: simplified provisioning, increased flexibility, improved performance and reduced costs. An added benefit of NFV is the ability to share network functions in a multi-tenant environment. In the past, most network solutions have been designed with a one-to-one relationship between a tenant and the set of network functions being delivered. To scale the solution, the applications running on one blade would have to be replicated on another blade to support a new client. Alternatively, some solutions use a large, proprietary and expensive appliance in the datacenter to support multiple tenants with software-controlled partitioning. It is possible, however, to build a cost-effective multi-tenant solution with NFV. Each network function can run in a process, which can be called by tenants as needed, at any time. This allows the service provider to leverage the cost-performance curve of industry-standard server blades and deploy scalable services using familiar technology components (database software, VM hypervisors, layer 2 switches in the core, etc.). If implemented in conjunction with SDN-enabled infrastructure service providers can dramatically reduce their costs and speed time to market for new services. Consider these SDN/NFV advancements within the context of introducing a managed security service for SMBs. Small and medium businesses are under attack, with cybercrime on the rise and extremely negative consequences associated with breaches that put customer credit card and identity information at risk. Complicating matters is the fact that legacy perimeter-based security solutions have become less effective with the proliferation of internal wifi hotspots, the increase in BYOD usage and the rapid adoption of cloud services. It is now commonplace to store critical data on both public and private clouds blurring the lines between “trusted” and “untrusted” networks. Even those SMBs with the desire and financial resources to build and manage their own security infrastructure have found it difficult to find qualified, knowledgeable IT personnel. The complexity of cyber-threats has clearly outpaced the ability of SMBs to adequately protect themselves. There is huge demand for an affordable managed security service yet service providers cannot profitably pursue this opportunity using the traditional approach of dedicated security appliances located in the datacenter or on-site at the SMB location. SDN’s centralized control functions and NFV’s level of abstraction can dramatically lower the entry costs for the customer and the operating costs for the service provider. Instead of a rack of dedicated network and security appliances for each customer site, a simple CPE device can be designed to work in tandem with NFV-based software in the datacenter. All logic and policy enforcement can be done in the datacenter and implemented in a scalable manner using a multi-tenant approach. For example, a firewall process can provide application-layer filtering and be scaled independently from any other software by adding blades to the host VM/hypervisor running the application. Using this design, the service provider is now positioned to roll out additional managed security services like IDS/IPS, anti-virus, URL filtering and more on the same platform. New services can be introduced without requiring additional dedicated CPE appliances and without network-wide software reconfiguration or updates. The business model improves as the service portfolio expands. The next generation of network infrastructure will revolutionize the edge and service delivery and give service providers a highly effective weapon with which to counter the margin-eroding effects of commoditization. 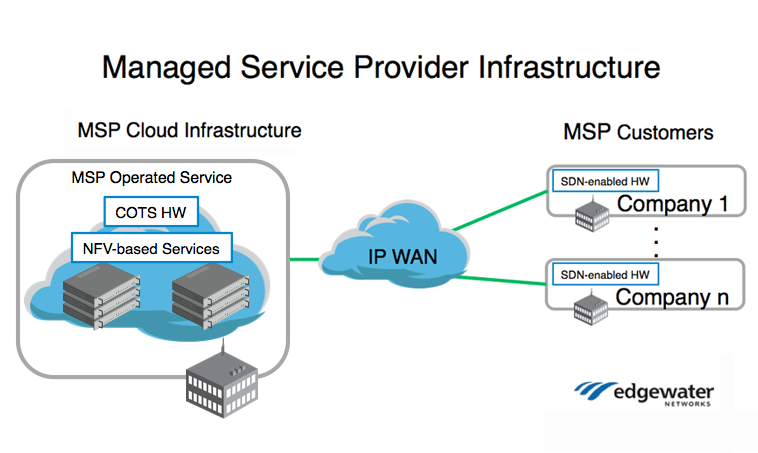 Until they hit the market, service providers can look at the existing edge platforms for delivering managed IP-based services. Start discussions today with the market leaders who have demonstrated success at the edge and who know how to work with service providers (and not compete with them). Find out how they plan to use SDN/NFV to lower operating costs, maximize service levels and scale functionality across multiple sites, clients and applications. The news at the edge is good – stay tuned for more details. Dave Martin is a recognized expert in network edge technology and managed service platforms for the delivery of IP-based voice, video and data services. 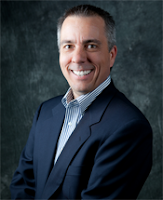 He currently serves as Vice President of Marketing for Edgewater Networks. 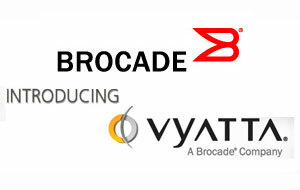 Brocade introduced its Vyatta 5600 vRouter designed for NFV deployments in telco-class networks. The Brocade Vyatta 5600 virtual router is a follow-on from the company's Vyatta 5400 vRouter for multitenant workloads, which is deployed in some of the largest clouds, including Amazon, Rackspace and SoftLayer. The Vyatta vRouter runs on multicore Intel x86 servers. The new Vyatta 5600 is up to 40 times faster than competitive virtual routing products, according to Brocade, as it leverages the latest network-centric x86 packet processing technology from Intel and 10 GbE Network Interface Cards (NICs). 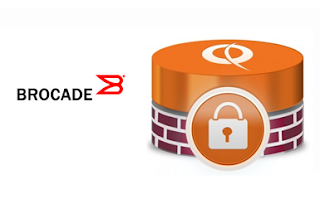 Brocade's vPlane technology enables up to 10 Gbps throughput per x86 core. The first use cases include BGP routing, ACL offload and Virtual BGP Route Reflection. The Vyatta 5600 vRouter is currently in limited availability and scheduled for general availability at the end of 2013. In November 2012, Brocade announced its acquisition of privately held Vyatta, a developer of networking software, in an all-cash transaction. Financial terms were not disclosed. Vyatta, which was based in Belmont, California, developed a software-based network operating system that is highly relevant for multiple applications in network virtualization, software-defined networking (SDN) and private/public cloud computing platforms. The Vyatta Network OS delivers advanced routing and security functionality for physical, virtual and cloud networks. It includes dynamic routing, stateful firewall, VPN support, traffic management, etc. and runs on multicore x86 processors, common hypervisor platforms and emerging cloud architectures. Vyatta expanded the platform to include Policy-Based Routing (PBR), BGP Multipath, IPsec for IPv6 and other advanced capabilities. DE-CIX, which operates the massive Internet Exchange in Frankfurt am Main (Germany), will establish Internet exchanges in major U.S. metro regions. New York City has been chosen for its first distributed, carrier- and data center-neutral Internet Exchange for North America. DE-CIX makes this game-changing move in the North American telecommunications market in an effort to begin boosting the country’s vital digital infrastructure and the infrastructure of the cities in which it will operate. 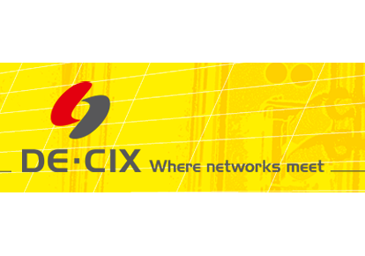 DE-CIX said it plans to use the same open model as in Frankfurt for the high-capacity, high-performance Layer 2 peering interconnection. 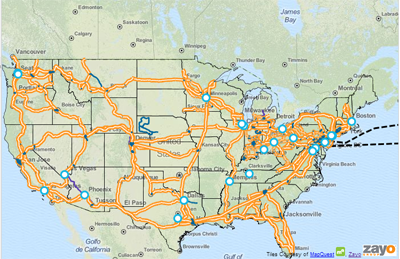 Different than the prevailing U.S. Internet traffic exchange model, DE-CIX will deploy a large-scale Ethernet switching fabric, combined with an all-fiber metro optical backbone that supports traffic volumes of up to numerous Terabits per second across multiple data centers in the selected metropolitan areas. This will enable all types of Internet providers to exchange traffic across the neutral, distributed infrastructure. This is an advantage over current U.S. colocation and exchange models, in which data centers primarily serve their own on-campus tenants or connect customers with passive Private Interconnects (PI). "Establishing and developing the new exchange will go far in elevating New York’s reputation as one of the world’s great technology hubs, in addition to its other first-rate attributes. DE-CIX’s new exchange in New York will be operational soon, while we are also planning for deployments in Silicon Valley and Los Angeles. DE-CIX will help these selected cities to grow their role as Internet hubs and finally achieve the major role they deserve in the global Internet ecosystem," said Harald A. Summa, CEO for DE-CIX. 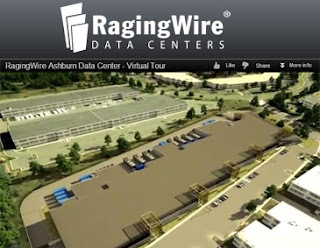 RagingWire Data Centers closed on a $230 million credit facility to fund its strategic growth plan and ongoing expansion of its data center campuses in Sacramento, California and Ashburn, Virginia. The funding was led by Bank of America Merrill Lynch, co-led by Comerica Bank, and included eight financial institutions in total. The interest rate varies from 200 to 350 basis points over LIBOR depending on leverage. “We are pleased that our company is attracting significant investments from top financial institutions,” said Mark Morrow, chief financial officer at RagingWire. “The credit facility is structured to give us the ability to execute our strategy to grow the company rapidly and responsibly at favorable rates and terms." RagingWire noted that its 500,000 square foot data center campus in Sacramento is almost entirely full and plans are underway for an additional facility in the area. In Ashburn, Virginia, the heart of “Data Center Alley,” RagingWire has five data center vaults within a 150,000 square foot facility and plans to build a 1,500,000 square foot campus on 78 acres of land in Ashburn that the company recently acquired. América Móvil and AT&T are enhancing their network interconnections to serve multinational companies operating in Latin America and the U.S.
Interconnection to América Móvil's group of companies' networks provides AT&T customers access to 15 markets in Latin America, with more than 2,000 MPLS-enabled IP services nodes and more than 50,000 service/access POPs covering: Argentina, Brazil, Chile, Colombia, Costa Rica, Dominican Republic, Ecuador, El Salvador, Guatemala, Honduras, Mexico, Nicaragua, Paraguay, Peru and Uruguay. More than 91,000 miles of América Móvil group of companies' fiber optic network installed throughout the region, and 12 data centers in Latin America. Six markets with enhanced Ethernet availability via América Móvil in Argentina, Brazil, Chile, Colombia, Ecuador, and Peru. Additionally, interconnection to the AT&T global backbone network enables América Móvil MPLS-based services to reach 163 countries over 3,800 service nodes and 38 on-net data centers across the globe. "AT&T's goal is to provide delivery of a consistent global experience for our customers who continue to expand internationally, and especially in Latin America," said Roman Pacewicz, AT&T Business Solutions senior vice president of marketing and global strategy. "The long-standing relationship with the América Móvil group of companies is a key pillar of our global strategy. The enhanced regional interconnection will allow us to provide deeper in-country reach in the entire region to match our client's expanding presence in Latin America." "We are pleased to offer our mutual multinational clients the combination of AT&T's footprint with the infrastructure of our operating companies, from Telmex to Embratel and Claro," said Isidoro Ambe Attar, Corporate Executive Vice President at Telmex. "Enhanced global access and sound combination of core competencies and product portfolios will be essential for our clients to improve their productivity and efficiency through advanced solutions." 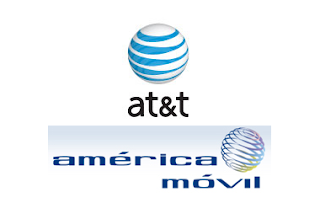 As of June 30, 2013, América Móvil had 262 million wireless subscribers and 67 million fixed revenue generating units in the Americas. America Movil has operations in 18 countries in the Americas, more than 30 million fixed lines, 18 million fixed broadband accesses and more than 17 million television subscribers. 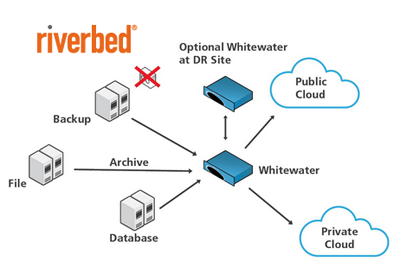 Riverbed Technology revamped its Whitewater cloud storage appliance family with new models that provide more capacity, faster ingest speeds and more replication options. Enhancements include new Whitewater model appliances with up to triple the cache of previous models and support of up to 14.4 petabytes of logical data. A newly released Whitewater Operating System (WWOS) 3.0 also offers new features, including pairwise replication that enable enterprises to replicate to an additional Whitewater appliance at a secondary location. In addition, enterprises can now leverage the 10G interface to dramatically improve ingest performance. It also offers support for pairwise replication for Whitewater appliances that allows enterprises greater flexibility to choose the appropriate recovery option to meet their RTO based on their business continuity plans. For the fastest RTO, a Whitewater appliance can recover at disk speed to a secondary site. In addition, the new OS offers a pinning feature that allows enterprises to tier and choose which backup data sets are available on the Whitewater appliance cache for immediate access, while less critical backup data sets can be recovered from the cloud. Riverbed said its Whitewater appliances are well suited to leverage cloud storage services such as Amazon Glacier, which offers pricing as low as a penny per gigabyte each month and is designed to have average annual durability of 99.999999999% for an archive. Zayo Group has added more than 2,500 route miles in the southeast region of the U.S. The new routes will extend Zayo’s long-haul connectivity into Richmond, Va., Raleigh, N.C., Tampa, Fla., and Orlando, Fla. As a part of this expansion, Zayo will also be able to provide diverse connectivity into the existing metro market of Miami. Zayo offers a suite of high-bandwidth services, including wavelengths, Ethernet, IP and SONET. 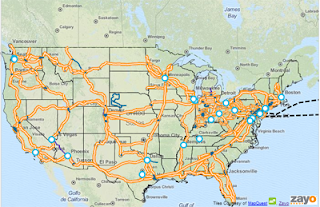 Key manufacturing, oil and gas, and financial customers in the region will now have access to Zayo’s broader fiber network, which now spans 76,800 route miles connecting approximately 300 markets throughout the U.S. and Europe. Oclaro has begun sampling a low-cost 10G Ethernet SFP+ transceiver for single-mode fiber applications up to 2 km. The 10G SFP+ CPRI transceiver is optimized for wireless backhaul applications and is compliant with the IEEE 10G Ethernet transceiver standards as required by the Common Public Radio Interface (CPRI) specification covering the CPRI rates from 2457.6 Mbps (Option 3) to 9830.4 Mbps (Option 7). 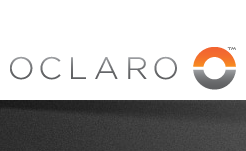 Oclaro said its SFP+ CPRI transceiver uses a Fabry-Perot (FP) laser to keep design costs low while offering high performance with a reach of 2 km over single-mode fiber and an extended temperature range of -40 to +85 degrees.